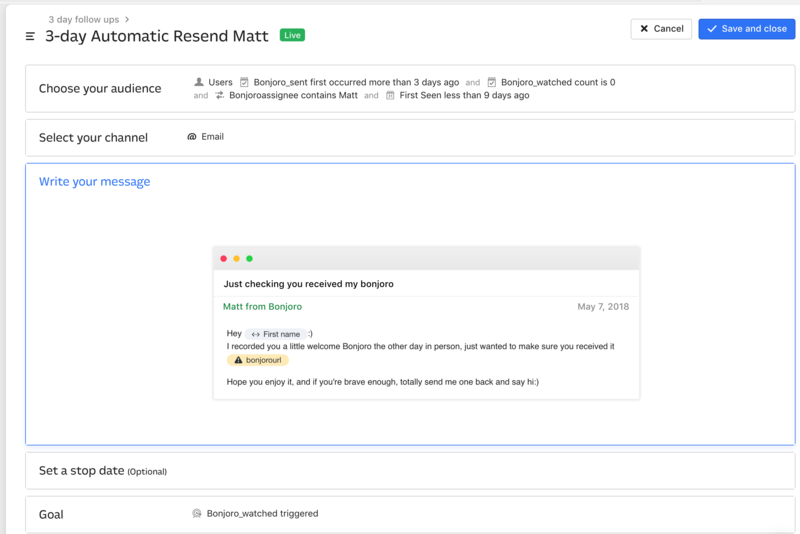 To re-send Bonjoros, you can use our Re-send function in your Bonjoro account (SET UP HERE) for simplicity, however if you want more customisation you can also do this via your CRM. To learn how, read on. 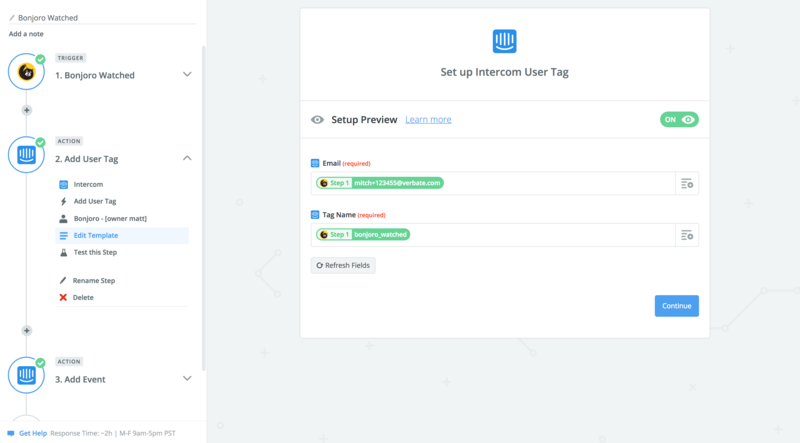 I've structured this around Intercom.io - however the principles should apply to many CRM's. You may need to play around with the settings a bit for different setups but this walkthrough should get you most the way there. We've shown plain-text resends of unwatched Bonjoros after 3 days to increase views by 10 - 20% on average. This feature will soon be available in the Bonjoro platform, but some users may prefer to run this through their CRM for extra control. I'll explain how this is set up and works below, and then how this can be used to trigger future messaging actions in your CRM, depending on if a Bonjoro is watched or not. Using Zapier - set up a workflow with "Bonjoro Watched" as the trigger, and the action as "Add user Tag". 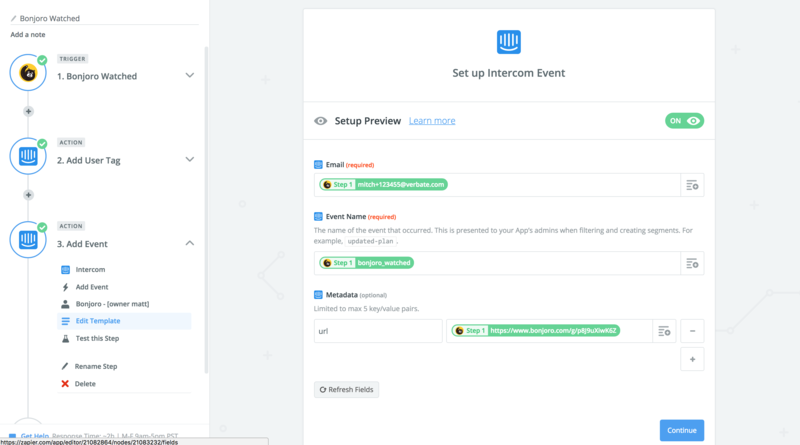 Here we use Intercom, but this will work in a similar fashion for most CRM's and Mailing lists. 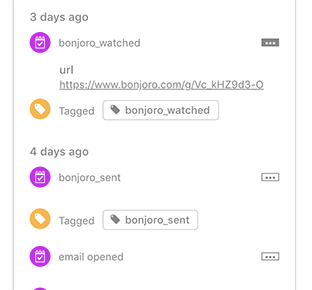 Repeat this with "Bonjoros sent" and you should start to see tags applied to your customers when you send a bonjoro and when a bonjoro is watched like below. 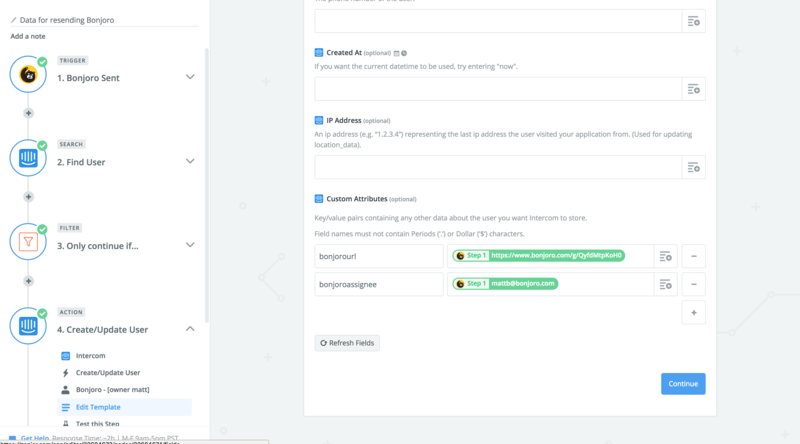 The important thing here is that you need to choose the email from Bonjoro sent, and then "Find user" with that email in Intercom - to match them, and then Step 4 - we edit that user in Intercom by adding 2 custom attributes. These are the Bonjoro URL (the page which the Bonjoro plays on) and the email address of the person who sent the Bonjoro. NOTE: Step 3 is optional. We add in a fliter to only continue if the customer exists. This is because Step 4 in intercom only allows CREATE / UPDATE USER so if you ever send a Bonjoro to a non-customer, it ends up creating them as a customer in intercom. You now need to create a 3-day (or however many days you wish) follow up message for EACH team member who sends bonjoros. The reason is that we want to send the follow up from the same team member that sent the original Bonjoro. Not only this, but you can also measure the impact on a Bonjoro on your conversion, conversations and retention over time.